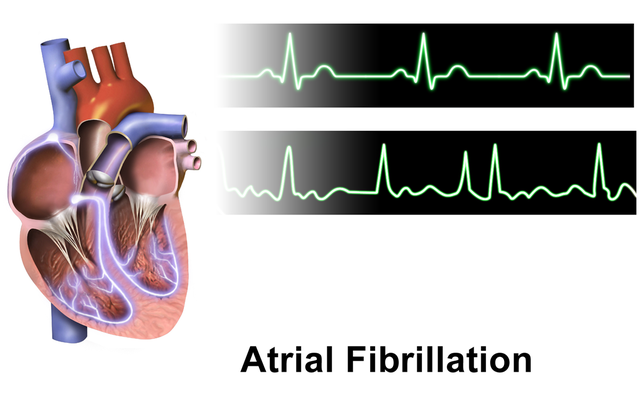 Afib is atrial fibrillation in which the atria contract irregularly. Chf is Congestive Heart Failure where the improper pumping of the heart causes fluid buildup in the body. Afib is atrial fibrillation, which is the condition in which the atria beat in an irregular rhythm. Symptoms of atrial fibrillation include having difficulty in breathing, heart palpitations, a feeling of weakness and difficulty exercising. People with afib also often feel faint and lightheaded. They may also experience some chest discomfort. Echocardiography is how Afib is diagnosed and typically the P waves (which indicate atria contracting normally) are absent from the tracing. There is also often the presence of so-called fibrillatory or f waves that will be seen before the QRS complex and after each complex. This makes sense because the QRS shows the ventricles contracting which occurs after the atria contract. The f waves are not regular in any way. Thyroid function tests are also used for diagnosis in addition to ECG. A number of disorders can cause afib to occur; for instance, hyperthyroidism, high blood pressure, coronary artery disease, cardiomyopathy, and problems with the mitral or tricuspid valve. Although not as common a cause of Afib such conditions as myocarditis or pericarditis can cause the condition. The risk factors for developing Afib include being over age 60, having hypertension (high blood pressure), coronary artery disease or cardiomyopathy. Diabetics are also at increased risk for Afib. Afib can be treated by a procedure known as AV node ablation. 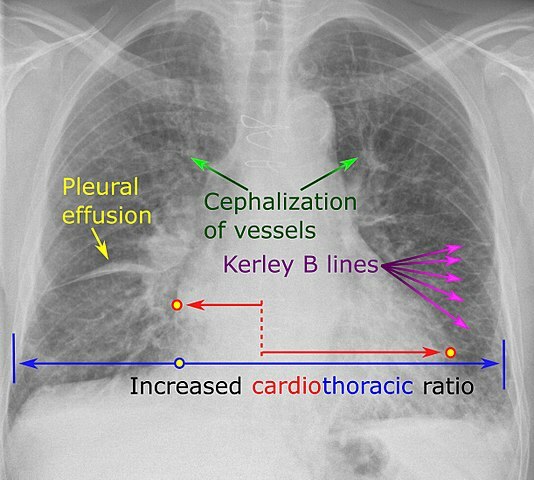 What happens is the doctor applies heat to a region between the atria and ventricles using a catheter. This has the effect of destroying the tissue that is not working properly. Drugs can sometimes work to control the fibrillation or in some cases, synchronized cardioversion may be needed. This is a low energy shock which helps to get the heart rhythm back to normal. CHF is Congestive Heart Failure and describes the condition in which the heart does not pump adequately leading to fluids building up in the body because the failing heart has a bad effect on the kidneys. This accumulation of fluid in organs then causes congestion. The symptoms vary depending on which ventricles of the heart are affected. When the left ventricle is failing, symptoms include feeling very tired, having difficulty breathing and reduced cardiac output. Breathing difficulties and problems with cardiac output are particularly noticeable when a person exercises. When the right ventricle is failing patients have symptoms such as swollen ankles and fatigue. The liver can also become congested leading to abdominal pain. Left ventricular failure can lead to CHF as well. Congestive Heart Failure can be diagnosed with a physical examination along with various tests such as ECG, chest X-ray, and cardiac radionucleotide scan. Tests of the levels of N-terminal pro b-type natriuretic peptide and B-type natriuretic peptide can also help with diagnosis and in determining how severe the condition is. Congestive Heart Failure can be caused by diabetes and other disorders that lead to damage to the heart muscle. Hypertension, coronary artery disease and having a heart attack can all lead to Congestive Heart Failure. Various cardiomyopathies, congenital heart defects, and valve disease can also be a cause of CHF. Having a family history of heart disease, being diabetic and having high blood pressure are risk factors. Additional risk factors for CHF include cardiomyopathy, heart valve problems, and coronary artery disease. Treatment of Congestive Heart Failure can be aimed at the cause, and can also include various medications. Changes to the diet and lifestyle can be helpful for patients especially if they have high blood pressure. An implantable cardioverter-defibrillator may be needed by an individual who also has ventricular fibrillation or tachycardia. In some situations, a patient might even need a heart transplant. Difference Between Afib and CHF? Atrial fibrillation (Afib) is the condition where the atria beat in a very irregular way. Congestive Heart Failure (CHF) is the condition where the heart does not pump properly causing a buildup of fluids in the body. Afib has symptoms such as feeling faint, lightheaded, having heart palpitations and difficulty with breathing. CHF has symptoms that may include difficulty breathing, feeling very fatigued, reduced cardiac output, swollen ankles, and congested liver. Thyroid function tests and ECG can diagnose Afib. ECG, cardiac radionucleotide scans, chest X-rays and tests of levels of N-terminal pro b-type natriuretic peptide and B-type natriuretic peptide can diagnose CHF. Afib is caused by conditions such as hypertension, coronary artery disease, and hyperthyroidism. CHF is caused by having a heart attack, coronary artery disease, high blood pressure, diabetes, valve problems, cardiomyopathy, and congenital heart conditions. Risk factors for atrial fibrillation include being older than 60, having hypertension, coronary artery disease or valve problems. Risk factors for Congestive Heart Failure include having hypertension, diabetes, a family history of heart problems, and coronary artery disease. Treatment options for Afib include AV node ablation, medication, and synchronized cardioversion. Treatment options for CHF include changes to diet and lifestyle, medications, implantable cardioverter-defibrillator, and in serious situations, a heart transplant. Afib is atrial fibrillation in which the atrial chambers do not contract in rhythm. CHF is Congestive Heart Failure where the hearts’ inability to pump properly causes fluid to accumulate in the body. Both Afib and CHF can sometimes be treated with medication and can both be caused by hypertension and coronary artery disease. Dr. Rae Osborn. "Difference Between Afib and CHF." DifferenceBetween.net. November 19, 2018 < http://www.differencebetween.net/science/health/difference-between-afib-and-chf/ >. Wasmer, Kristina, Lars Eckardt, and Günter Breithardt. "Predisposing factors for atrial fibrillation in the elderly." Journal of geriatric cardiology: JGC 14.3 (2017): 179.